The MOORISH WORD is dedicated to all head officials, Mufti Staff and to all of our members who assist in the great program of uplifting fallen humanity. We uplift fallen humanity by following our Prophets teachings. We truly pray that this newsletter will be inspirational and informative to all who read it. 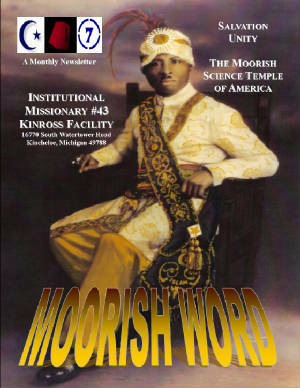 The Moorish Science Temple Of America Inc. was founded in 1913 by Prophet Noble Drew Ali for the sole purpose of uplifting fallen humanity, coming as he did in somewhat the same manner as did Jesus, Mohammed, Buddha and Confucius and other Prophets of their day. It is truly wonderful and astounding to see one come into this "Mad Human Drama" for the sole purpose of saving humanity. 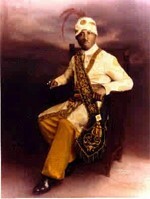 This picture is the likeness of our Prophet Noble Drew Ali who serves humanity through His teachings. Since His passing in 1929, there have been five successors to Prophet Noble Drew Ali, Bro. C. Kirkman-Bey, Bro. F. Nelson-Bey, Bro. J. Blakely-Bey, Bro. R. Love-El, and the present Grand Sheik of the Moorish Science Temple Of America Inc., Bro. R. Jones-Bey. It is through this lineage that we have been commissioned at this Missionary Temple and elsewhere throughout the country to foster the lofty teachings of Love, Truth, Peace, Freedom and Justice. In the more than thirty years since the Moorish Science Temple of America Inc. existence within these institutions, Bro. William Parker-Bey (1912-2006), has been our greatest inspiration. His life was the pattern for men to follow that leads the way to virtue. Bro. William Parker-Bey always encouraged the Moors to be faithful to Allah and the Temple and we would be blessed. Islam as brought by our Prophet Noble Drew Ali has found it's way into the hearts and minds of thousands of brothers and sisters who had no direction in life and who now follow the Prophet to a destiny which is not uncertain nor unknown. Allah, the Father of the universe, the Father of Love, Truth, Peace, Freedom and Justice. Allah is my protector, my guide and my salvation by night and by day through His Holy Prophet Noble Drew Ali, "AMEN". CLICK ADDME TO ADD YOUR SITE TO NUMEROUS SEARCH ENGINES FOR FREE!